His comments, prompted by a question from an analyst, were widely understood to be a “non-denial,” something that Apple executives are good at. Rather than saying explicitly that they are working on something, the executive says the area is “interesting”… And, two years later, Apple brings a product to the market. But, in the case of virtual reality, that may not be a wise move. Here's why. 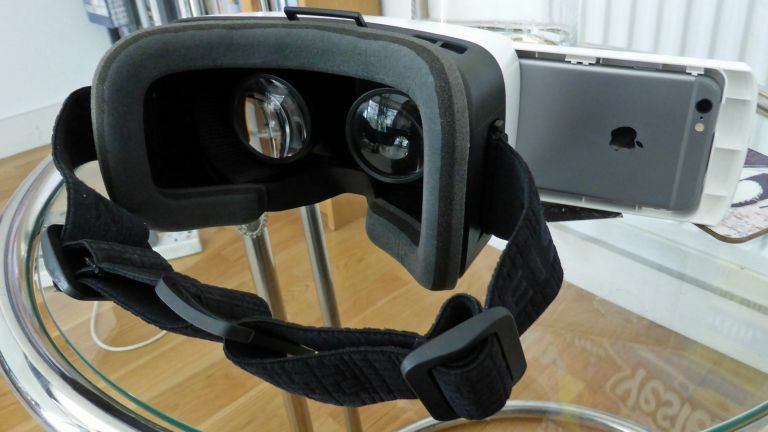 Could Apple take on Oculus Rift and HTC Vive, with a high-end headset powered by the Mac? It just doesn't feel likely, culturally or technically. It's not impossible that Apple will update the Mac lineup with high-end graphic cards, but it's clearly not the company's main focus; that's iPhones and iPads. Apple has always been about style, design and lookin' fine. Most recently, although Apple Watch might not have been a huge, mass-market success, it even pushed the brand into the style mags and the shelves of Selfridges. Could you really envisage the brand behind the Watch with Hermés straps knocking up a plastic box that you attach to your face? NOBODY can make that look chic 'n' fierce, not even Jonathan Ive. So if desktop VR is unlikely, how about the mobile variety? Again, it just doesn't feel plausible. Apple has built its rep on putting out polished products that feel high-end enough to justify the high prices it asks. And when it doesn't, all hell breaks loose. Remember that battery pack it put out a few months back, that wasn't very aesthetically pleasing? Sure you do - people are still laughing about it now. From what we've seen of mobile VR so far, the experience just doesn't feel luxurious, futuristic or 'Apple-like'. LG's 360 is outright poor and even the pick of the bunch, Samsung's Gear VR, is little more than a novelty distraction at heart. That's not just because of the headsets themselves, it's because phone screens and processors are not up to the task of delivering a really immersive VR experience. Apple is not suddenly going to massively up-spec its CPU and screen just to support VR. Apple is hardly ever the first to a technology, but its contribution always adds something. There had been 'smartphones' before the iPhone, but its touchscreen-controlled combination of computer, music player and phone defined the market from the moment it was release; ditto the iPad. What could it possibly bring to VR beyond a brushed magnesium casing and nicely curved edges. Arguably augmented reality (AR) is another story. But we're not talking about AR. Well, who doesn't? And so far, nobody has found a reliable way to make dosh out of VR, either from hardware or software. Apple is interested in mass 'affordable-premium' markets. VR isn't one. According to Nvidia, only around 1% of PCs in the world today can handle the stresses and strains of delivering a decent VR experience. That suggests that, although there's plenty of general interest in VR, the number of people actually in the market to buy a VR headset is just not big enough for Apple. HTC trumpeted the (admittedly impressive) fact that it sold 15,000 Vive headsets in 10 minutes but Apple regularly sells 10 million iPhones in a weekend. Okay, Apple doesn't only do mass market. Its latest big product, the iPad Pro, is aimed primarily at those in the relatively small creative industry, an area Apple has long supported. But VR developers are a tiny niche, even within that sector. It makes no sense for Apple to make a product specifically for them. Sure, devs can create VR content on higher-end Mac desktop PCs, but Apple's not going to make a headset for them. Everyone is obsessed with Apple needing to innovate and create a big, new hit to match the iPod, iPhone and iPad. A VR headset would be neither a big hit nor, in the wake of Gear VR, Vive and Rift, especially innovative. Nothing about a VR headset sits easily with Apple's long-established way of doing things, and there's also currently no software for them to flog off the back of it. It's virtually unimaginable that it would create a headset. Next!